There will be occasions where you are left alone and would like to capture some video or you may be willing to capture a video without anyone absence. It may be hard to capture video or photos without second party. 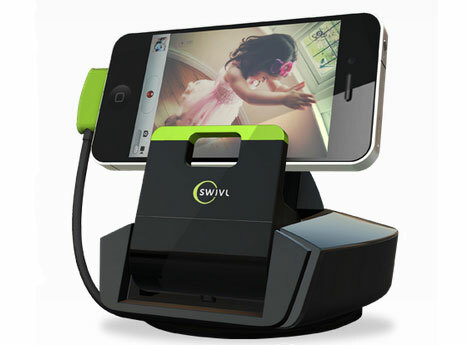 But with Swivl Stand filming yourself or themselves will be very easy. It is designed to hold an iPhone, iPod Touch , any Android phone or Flip camera. The moment you fix the camera device and start recording, it captures your movies by using an advanced Multi-Axis Motion mechanism. This makes your to share your ideas,share you game , share live video on webcam while cooking in kitchen and many more. This Swivl Stand is a concept design undergoing strees testing which will be soon available in market. Advantage with this stand is there is no setup required and tripod compatible. It is available now for pre-order,with a price tag of $160. If you want to make your camera to follow your action, then this is the must buy gadget.